This film is so amazing. 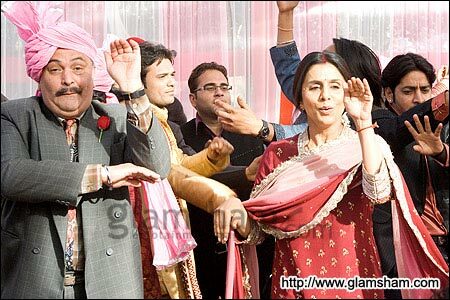 It reminds me a lot of ‘Little Miss Sunshine’ in the way of how the family deals with their issues and sticks together. I love seeing films like this. Very feel good story with extremely likable and relatable characters who stick together. Disney is really on a roll with their foreign films. 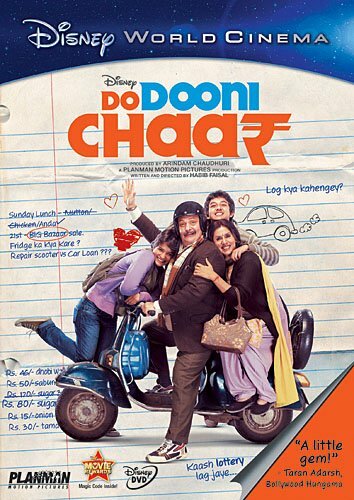 This film, ‘Do Dooni Chaar’ is not just a great foreign film, but a movie you can add to any collection of you love movies. What a treat this was. ‘Do Dooni Chaar’ follows the Duggal family in their routine life. The father is a well respected school teacher who with the economy in the bad state it’s in, is having his paychecks dwindle faster than he would like. All the while, the price of living and his family is going up, up, up. His daughter is an insane teenage rebel, his son deal quite a bit in illegal businesses, and his wife has a giant taste for aristocratic living. You know, your normal family living life routinely. So the Duggal’s trade their scooter in for a car with four wheel and they all journey together to a big event. On the way to their destination the family learns what it means to be part of a family complete with all the hijinks that take place on the road. The writing is superb and the characters are charming. This makes for a comedic and heart warming film for all to enjoy. I can see this being remade in the states. What a great little film. The video is presented in widescreen in 2.35:1. It is not in hi-def either. But overall the picture looks good being it’s on DVD and being a Bollywood film. Some grain here and there and the colors are bright but they don’t pop. The sound is a 5.1 Dolby Digital track. It’s in Hindi as well, but there are english subtitles, but only for the feature film. The audio sounds pretty great for being mostly a dialogue driven film with little action sequences.. The dialogue is crystal clear though. Needs a DTS track. All I can say is ‘SEE THIS FILM’. It begs to be seen. It’s feel good and the charm and wit it has is infectious. I twas such a pleasure watching this film and I will definitely show this film to friends and family. The acting is top notch and the script is amazing. Highly recommended. See it. This entry was posted on Thursday, August 11th, 2011 at 8:56 pm	and is filed under Film, News. You can follow any responses to this entry through the RSS 2.0 feed. You can skip to the end and leave a response. Pinging is currently not allowed.